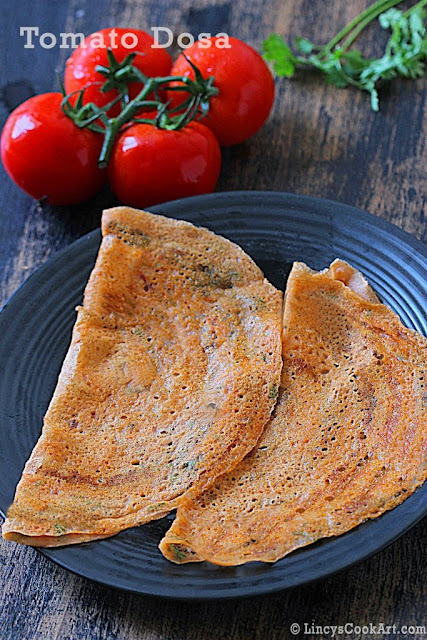 Tomato Dosa | Thakkali Dosa: Idli Dosas are a comfort food for every South Indian. But we generally grind the batter and allow it to ferment for atleast 6 hours to 10 hours to get a nice idli dosa batter. Instant dosas like Rava dosa and Neer Dosa comes handy which could be prepared without fermentation which saves our time. Today i have come up with one such recipe which every one love to try with. Simple yet a tasty colourful and a flavourful dosa. Very less ingredients and little effort to make this tasty dosa. Easy to prepare crispy dosa made with out fermenting the batter which goes well with any simple chutneys or sambar. Wash and soak the raw rice for 3 to 4 hours in enough water to immerse. Drain the water and keep the rice, roughly chopped tomatoes, dry red chillies, hing and salt inside the blender jar and grind to make a fine paste. Transfer the batter on a bowl and add the coriander leaves; mix well. Take a ladle full of batter and spread on a hot dosa tawa on concentric circles. Or add extra one more cup of water into the batter and heat the tawa to high heat and pour the batter from the edges of the pan to the centre like rava dosa. Drizzle half a teaspoon of oil and cook the dosa on medium flame till crispy. It takes little longer time to cook this dosa than a regular dosa. Flip and cook if you make it in concentric circles. 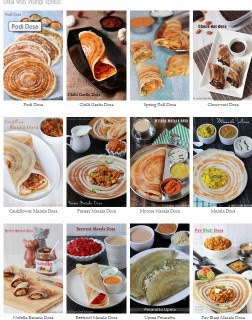 If you spread like rava dosa flipping the dosa may not be required. You could make this dosa using normal dosa batter by grinding other ingredients as a paste and add it on a dosa batter. You could use red chilli powder instead of dry red chillies. Note:You could refrigerate the left over batter for later use. Mix the batter well and prepare each dosa add water to the batter if required after preparing some dosas. Heat of the pan is essential to form the holes in that dosa. Raw rice means pacha arisi or idly arisi . Raw rice actually means pachai arisi but you could use idli rice(i.e half parboiled) too for this recipe. Both gives same result.